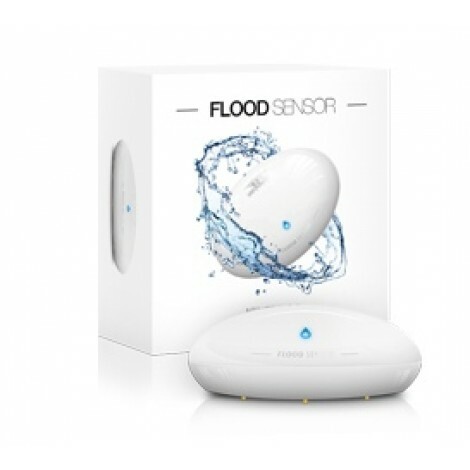 Fibaro Flood Sensor is a universal, Z-Wave compatible, flood and temperature sensor. Device can be battery (ca. 2 years battery life) or VDC powered (12 or 24 VDC). Flood alarm is sent to the Z-Wave network devices or additionally to any alarm system controller, through opening a NC contact. The device has built in temperature sensor, monitoring temperature of e.g. floor. 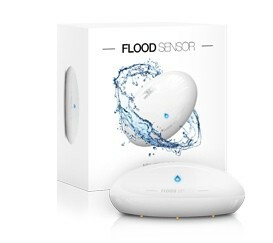 Fibaro Flood Sensor is designed to be placed on the floor or on a wall with a flood sensor probe extended by connected wire. The device has built in LED indicator and acoustic alarm. In addition, the sensor is equipped with a tilt sensor reporting tilt or movement to the main controller e.g. when someone has taken the Sensor from its original location. LED diode signals flood, operating mode or the Z-Wave network communication range. Fibaro Flood Sensor is sink-proof, which means it drifts on the water surface and keeps on sending alarm signal in case of substantial inundation of water.